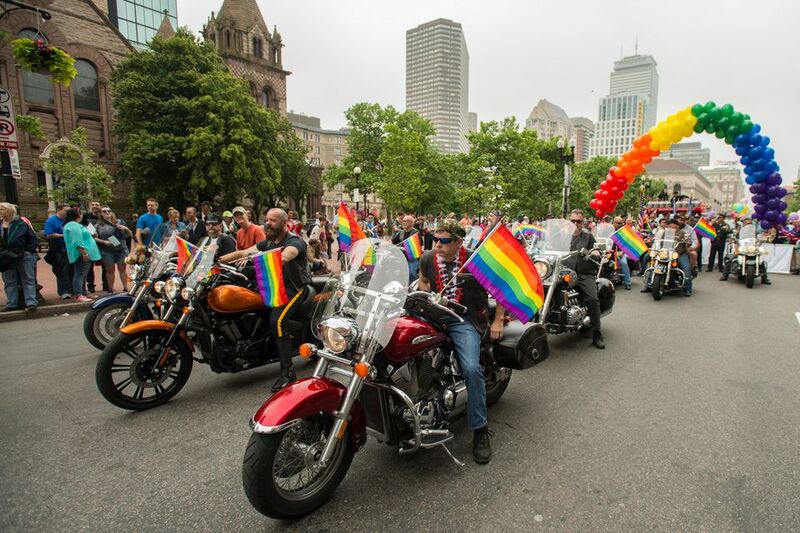 The largest gay pride event in New England, and one of the most popular on the Eastern Seaboard, Boston Gay Pride takes place each year in mid-June - in 2016, the main parade, festival, and neighborhood block parties take place the weekend of June 11 and June 12. There are a number of related community events held throughout the prior week, including a Flag-raising at Boston City Hall on Friday, June 3; a Pride Day Celebration at Faneuil Hall, held Saturday, June 4; a Pride Night at Fenway Park on Friday, June 10; a Boston Youth Pride dance on June 11; a series of Boston Black Pride & Boston Latino Pride gatherings; and much more - from a Seniors Tea Dance to a Pride Cruise - here's a full calendar of Boston Pride Week events. Saturday, June 11, is the most prominent day of Boston Pride Week. At noon, the 46th annual Boston Gay Pride Parade commences at noon, starting at Boylston and Clarendon streets, jogging down into the city's most gay-identified neighborhood, the historic South End. The parade winds northeast, then north on Berkeley Street into the Back Bay, where it turns east onto Boylston Street and passes by the famed Boston Public Garden and the posh (and very gay-friendly) Four Seasons Boston. It then turns left onto Charles Street, heading north alongside the scenic Boston Common, before turning east on Beacon Street and passing before the Massachusetts State House, then winding around Tremont Street and Cambridge Street to end at Boston City Hall. This is one of the more popular and scenic gay pride marches in the country, drawing enormous crowds and passing before some of the city's most prominent sites. 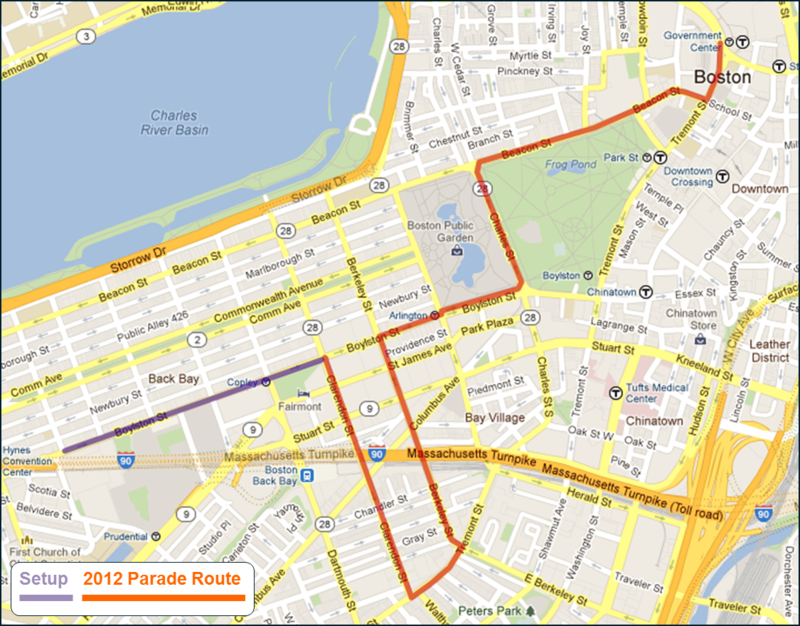 Here's a map of the Boston Gay Pride Parade route. Kicking off at 11 am on Saturday and lasting until 7 pm, the Boston Gay Pride Festival takes place at City Hall Plaza, right where the parade ends. At the festival, participants watch a number of top entertainers, including headlining Australian singer-songwriter Conrad Sewell as well as Samantha J, Brandon Skeie, and Samantha Johnson, visit with more than 130 business vendors and community groups, and mingle with hundreds of fellow participants. This will be followed by several parties around town that night. On Sunday, the fun continues with a pair of GLBT Block Parties, held in two of the city's most gay-popular neighborhoods, the Back Bay and Jamaica Plain. In the Back Bay (right by the South End), the Back Bay Block Party takes place from 1 until 8 pm. Over in Jamaica Plain, affectionately known as "JP", the Jamaica Plain Block Party takes place from 2 until 8 pm on Perkins Street, between Centre Street and South Huntington Avenue. Note that Boston's gay bars along with plenty of restaurants, hotels, and shops have special events and parties throughout Pride Weekend. Check the website of local LGBT websites and publications, including Rainbow Times, Bay Windows, Boston Spirit Magazine, and Edge Boston. Also check out my Guide on Gay Boston, and for general travel information, look no further than Greater Boston Convention and Visitors Bureau.